Make Your Lawn a Dead Ringer of the Graveyard with our Tombstones Props! 28" Tombstone Rocker" Tombstone measures approximately 28" high x 18" wide x 3" deep. Includes an UL Listed AC Adapter with 4' long cord. For indoor use only! Tombstone is made of hard foam and has latex head that rocks back and forth. Also includes a bracket that fits on the back side to keep tombstone upright. Please Note: Due to the larger size of this product, the shipping cost may be a bit more, depending upon the method selected. Shipping cost will be reflected at checkout. Creepy Outdoor Gravestones These Creepy Outdoor Gravestones will transform your lawn into a frightening cemetery. When your yard is filled with gravestones this realistic, even mowing the lawn becomes a spine-tingling experience. Brompton Cemetery Gravestones Our Brompton Cemetery Gravestones are modeled after authentic 12th-century graveyard designs found in London's Brompton Cemetery. Faux-stone gravestones feature a hand-rubbed finish to transform your lawn into a frightening time-worn graveyard. Cast from a combination of lighter-in-weight polyresin and stone powder, these cemetery gravestones will last in scary outdoor weather. • Overall Dimensions: 16.5 x 8 x 36 "
Guardian of the Grave Animated Prop None will pass the Guardian of the Grave Grim Reaper unscathed. The Guardian of the Grave animated prop is a professional quality decor piece that elevates your haunted house to a haunted castle. The cloak garbed skeleton Grim Reaper rises from behind his skull encrusted tombstone to welcome evil and ward off goodwill. Spooky! Eerie Acres Cemetery Lawn Sign Eerie Acres Cemetery Lawn Sign is weathered green and gray is made of molded plastic and metal and measures approximately 27.5" wide x 20" high (not including metal stakes). Sign says "Eerie Acres Cemetery Est. October 31, 1899". Stakes are included and measure approximately 10" high. Haunted Valley Cemetery Lawn Sign Haunted Valley Cemetery Lawn Sign is green with white lettering that says ""Haunted Valley Cemetery, Come and Stay a While..."" Lawn sign is made of metal and plastic and measures approximately 24"" wide x 18.5"" high. Stakes are included and measure approximately 10"" high." Pirates Of The Caribbean Tombstone This foam tombstone has a pirate skull image with pirate swords and a captain's wheel in the background. The words "Pirates Of The Caribbean" run along the top of the stone and "Jack Sparrow" lettering can be found below the skull figure. Measures approximately 25" high x 16.5" wide x 2" deep. Two plastic ground stakes are provided.This is an officially licensed Pirates Of The Caribbean Disney product. Evil Bride Tombstone Foam tombstone has cracked apperance with "REST IN PEACE" lettering. Behind the tombstone, the evil bride is seen, giving the illusion of her rising from the grave. Please Note: Prop is not animated and does not move or light up. "18"" Skeleton Tombstone with Blood Dripping" made of weathered looking plastic. Eyes light up red. Requires (3) - "AA" Batteries (included). Features back lit translucent center that drips red blood. Measures approximately 18" high x 12" wide x 3" deep. For Indoor or outdoor use. Set to manual control with "Try Me" button or set to motion activated. Tombstone says the following phrases: "Ahh - By your appearance it appears that I'll be seeing you soon - with your name chiseled in stone." "You seem to be just the right size. I have a spare crypt that would suit you perfectly." " Rich or poor, healthy or sick, young or old - we all end up in the same place, don't we?" "I troll the crypts and graves and care for my grounds. Only the deceased may enter - you are not - that can be arranged." Animated Raising Gargoyle Tombstone has a button to push that makes the gargoyle rise out of the tombstone. Once activated, the gargoyle rises, eyes light up and his wings flap with a flapping sound. MMVIII (2008) is printed on the tombstone. Made of plastic with a faux marble look. Requires (4) - "AA" Batteries (included). Inside of tombstone lights up blue and green. Use button for manual operation or set to sound and motion activated. Includes a ""Try Me"" button. Gargoyle measures approximately 11" wide x 8" high (11" wide x 12" high when activated). Makes a scary, screaming sound when activated. Ancient Scriptures Tombstone 3 pack Rest in peace with this Ancient Scriptures Tombstone 3 pack. This authentic-looking Halloween accessory, carved with ancient scriptures and skull detail, is the perfect centerpiece to any dreadfully haunted graveyard or home. Mix and match with other Halloween Tombstones for a scary cemetery. Totally Ghoul Animated Hands on Tombstone Beware the tombstone ... of the UNDEAD! Tombstone measures 13.5 X 4 X 24. Haunted Funeral Home Lawn Sign Sign says "Rick O'Mortis' Haunted Funeral Home -Everyone's Dying to get in" and is made of plastic that measures 25" high x 19" wide (not including plastic stakes). Includes ground stakes that measure approximately 10" high. Ghostwood Light Up Grave Stone Ghostwood Grave Stone has the words "Ghostwood Place" that light up in an eerie purple and a skull at the top that lights up and makes eerie sounds. Push a button or set to motion activated. Light blinks. Grave stone requires (3) - "AA" Batteries (included). Made of plastic. Measures approximately 5" high x 10" wide x 8" deep. Grave stone says the following phrases: "Trick or Treat (laughter)" "Scary isn't it? (laughter)" "(Screaming)"
Haunted Manor Light Up Grave Stone Haunted Manor Light Up Grave Stone is perfect for your graveyard scene. The words "Haunted Manor" light up and flash in a sinister green and the skull below lights up in white. Decoration is made of plastic. Measures approximately 10.5" wide x 9" high x 5" deep. Press a button to light-up prop or set to motion activated. Requires (3) - "AA" Batteries (included). Also makes an eerie screams, and says: "Trick or Treat!" "Scary isn't it?" 18" Tombstone with 3 Skulls and Dripping Blood" made of weathered looking plastic. Features back lit translucent center that drips red blood. For indoor use only. Requires (3) "AA" Batteries (included). Eyes glow red when activated. Measures approximately 18" high x 12" wide x 2" deep. Tombstone says the 2 following phrases: "By your appearance it appears that I'll be seeing you soon - with your name chiseled in stone. (Laughs)" "You seem to be just the right size. I have a spare crypt that would suit you...perfectly." • Overall Dimensions: 8"L x 8"W x 24"H "
• Overall Dimensions: 12.25" L X 5.5" W X 25" H "
• Overall Dimensions: 14.15" L x4.15" W x 22.5" H "
36" Reaper Tombstone Tombstone has a reaper face on the front and is made of 100% Foam. Measures approximately 36" high x 18" wide x 2" deep. 2 Plastic stakes are included for easy lawn setup. Please Note: Tombstone pattern is printed on the front side. The back side is blank. 36" Tombstone With Ghoul Crashing Through Tombstone has a weathered appearance and shows a ghoul head crashing through. Made of 100% sturdy foam. Measures approximately 36" high x 17.5" wide x 1.5" deep. Includes 2 plastic stakes for easy lawn setup. For indoor or outdoor use. Please Note: Tombstone ghoul is printed on the front side only. The back side is blank. 21" Illuminated Screaming Reaper Tombstone" Plastic tombstone has a weathered and cracked appearance with a grim reaper and blood-stained scythe. The face of the reaper has a light-up effect along with screaming sound effects. Across the top of the stone, there is ""RIP"" lettering." * Stands roughly 30" tall!! • Overall Dimensions: 3.9 X 13.3 X 4.7 "
• Overall Dimensions: 14"L x 5.5"W x 26.5"H "
Family Cemetery Garden Stepping Stone & Wall Plaque Celebrate the spookiest time of year with our weather-resistant "cemetery" stone. We’ll laser engrave the family name up to 12 chars. Made of durable resin cast stone. Great for the garden or hang it in an entryway or next the front door. Comes with a keyhole back for hanging options. Measures 10 1/2”x11 3/4”Wx 3/8”D. 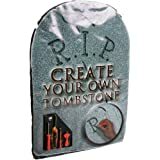 Cat Tombstone Halloween Stepping Stone Youll have guests wondering just what is waiting in the wings for them, when you create a haunted holiday with the help of this cat tombstone Halloween stepping stone. A sinister warning, crafted in the style of antique headstones, and featuring a glaring cat in the center. Enough to make even the cats fur stand on end. Plant it where it will curl the most toes  in your garden, along the walkway, or right beside the front door. Resin. 11 x 14 inches. .well, raise the dead. But if you just raise it so everyone can read the text, youll entertain and amuse the trick or treaters and everyone else who spots this skeleton tombstone Halloween stepping stone. Graveyard shift is best. No bones about it. Fun and freaky design crafted from faux parts. Resin. 9.25 x 14 inches. Small Tombstones - Set of 5 Stone-like markers are hand-painted and detailed! Each has a different spooky sentiment, stands alone or secures with stakes (included). Weather-resistant foam. 9 x 3/4 x 15 3/4"H.
• Overall Dimensions: 12"L x 3"W x 17.25"H "
Make your own tombstone or headstone! Carve your friends names, relatives name or whatever you want to say into the realistic hard foam blank! Grim Reaper Face Tombstone Setting up a grim graveyard? This Grim Reaper Face Tombstone makes a perfect addition. Tombstone is approximately 13" wide x 21" tall and comes with 2 plastic stakes on the bottom to attach to the ground. It has a weather-worn look of a real tombstone with a creepy image of the Grim Reaper and is made of foam. 22" Winged with Moss Tombstone This Winged Tombstone with moss is made of foam and comes with 2 ground stakes. Gravestone measures approximately 22" high x 15" wide and has a mossy covering around the base. Look for more tombstones (sold separately) to create the creepiest graveyard around. 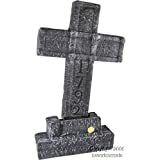 22" Mossy Celtic Cross Tombstone This Celtic Cross Tombstone is made of foam and includes 2 stakes. Grave marker has a covering of moss and skulls throughout the cross and base. Tombstone measures approximately 15" wide x 22" high. 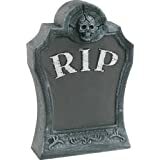 Look for a variety of tombstones (sold separately). 22" Skulls RIP Tombstone This 22" Skulls RIP Tombstone is made of heavy foam with creepy skulls on the bottom and a winged skull and crossbones at the top. 2 stakes are also included. Measures approximately 15" wide x 22" high. Look for more cemetery props (sold separately). 22" Mossy Bat Tombstone This Mossy Bat Tombstone is made of heavy foam, measures approximately 14.5" wide x 22" high and has moss covering it along with a flying bat on the top. Also includes 2 stakes. Look for more tombstones (sold separately) to complete your gruesome graveyard scene. 22" Skull and Crossbones RIP Tombstone This Skull and Crossbones RIP Tombstone is made of heavy foam with 2 stakes that are included. Tombstone is dark gray with a pirate skull and crossbones and measures approximately 15" wide x 22" high. Look for more cemetery grave markers (sold separately). 3D Skull Crossbone Tombstone This 3D Skull Crossbone Tombstone is an inexpensive addition for Halloween decorating. * Made of 100% sturdy foam. * Measures approximately 21.5" high x 14.75" wide x .75" deep. * For indoor or outdoor use. • Overall Dimensions: 11.75"L x 4"W x 18"H "